After a one-week absence (and before a three-week hiatus! 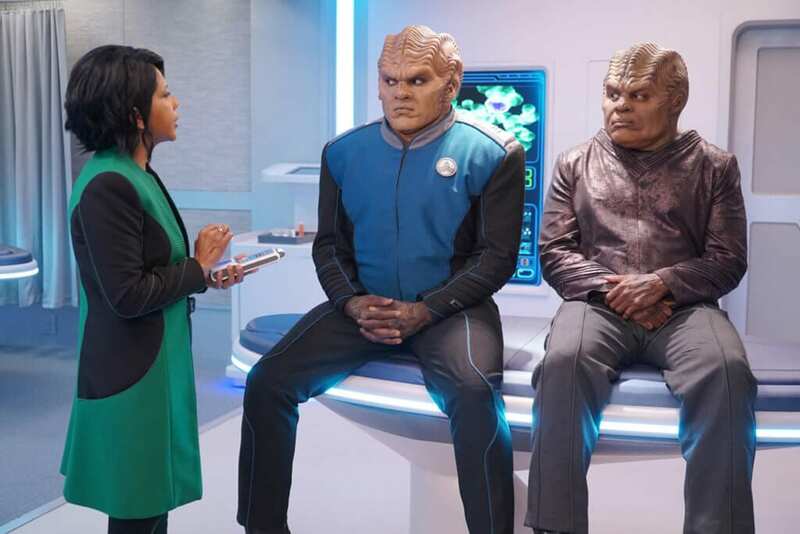 ), The Orville resurfaces this week with “Lasting Impressions,” a return to the slower, more character-driven episodes that began the season. Like “Blood of Patriots,” the focus is on Gordon, as new facets of his personality are explored, and the ship’s clown grows sadder. There’s also a hysterical subplot that, as has been the case for most of the season, revolves around Bortus. The Orville transports a time capsule from 2015 to a museum. Among the artifacts inside is a cell phone which, when powered up, delivers a message from a girl named Laura Huggins (Leighton Meester) and, through text messages, a glimpse into the past. While the rest of the crew show mild interest, Gordon is determined to know what Laura was like, eventually recreating her life with the Environmental Simulator. Bortus and Klyden discover cigarettes. The early moments of “Lasting Impressions” highlight several of The Orville’s strengths. On the most surface level, there’s another Star Trek guest star, as Voyager’s Tim Russ plays Dr. Sherman, the scientist in charge of the time capsule. Dr. Sherman doesn’t have much to do, but Russ’ presence is another loving callback to the show’s inspiration. The crew’s attempts to understand outdated technology and terminology are very funny (“But instead of writing, ‘wireless telecommunications facility,’ she simply wrote, ‘WTF.’”), and they set the stage for an episode unlike the last few, where the stakes were sky-high. Finally, the use of a time capsule from the present is a way to connect us with the characters, something at which The Orville excels. If you follow common responses on Twitter, you’ll often see people asking why the crew is always watching movies, reading books, and listening to music from our time, rather than something from the future. The reason is that these are things with which the viewer can identify, and through that, we can connect to Ed and company better than if they were referencing “The Bazecor Who Portibined the Jaworn.” Sure, we can figure out something like that from the context, but it won’t be as personal to us as Ed showing Teleya The King and I or Raiders of the Lost Ark. Dr. Sherman’s misreading of “WTF” makes him an out-of-touch dad trying to decipher his kids’ Facebook posts as opposed to a stuffy professor talking about museum findings. But the most human part of “Lasting Impressions” is Gordon’s. Once he watches the video Laura made for whoever would find her time capsule, he’s enchanted. She’s fun, pretty, and passionate, and he gets all that from a two-minute recording on her cell phone. John can tell he’s heading into unhealthy territory, but that doesn’t stop Gordon from using the Environmental Simulator to replicate Laura’s world. Of course, he goes looking for her, and he promptly falls in love with her. His argument when he tells his friends about her is that she isn’t like the other simulations because she’s an actual person, and the simulation is created from her life and personality, not from someone else designing a program to their specifications. Part of what makes “Lasting Impressions” interesting is that Gordon has a point; outside of entering Laura’s life himself, he isn’t interfering with it, nor is anyone else. Moreover, he brings up their acceptance of Isaac as a real person when he is, ultimately, artificial, just like this Laura. Other than the lack of tangibility (which the simulator takes care of, from the looks of things), isn’t what Gordon has with Laura as real as any other relationship? It is, right up till the point when he starts manipulating the simulation to suit him. Reality is fun until Gordon has to take the bad with the good – in this case, Laura getting back together with her on-again, off-again boyfriend after spending the night with Gordon. So he has the Simulator remove the ex from the equation, leaving Laura to him. In doing so, Gordon once again is faced with reality and its bittersweet give and take; Laura is now free to date him, but she’s lost an essential part of herself because she never met the guy who encouraged her to pursue it. And it’s her singing, her life’s great passion, that is excised with her old beau. Now, Gordon has to choose; if he makes himself happy, he ruins Laura’s life, but if he gives her back her passion, he loses her forever. Gordon’s a good guy, so he does the noble thing, allowing himself a duet with Laura before saying goodbye. But, just as Laura was changed by her relationship with her boyfriend, so is there now more to Gordon for knowing and loving her. What’s fascinating to think about in “Lasting Impressions” are the moral implications of altering the simulation. While Gordon does have a strong case for this Laura being real, at least to him, she is still literally a simulation. If he changes her life to make himself happier, is he really hurting anyone? Will she continue to exist if Gordon never activates the simulation again (which I doubt he would now)? Not really; Laura – the real, flesh and blood Laura – has already lived her life, presumably happily with her boyfriend. Gordon is effectively making himself unhappy to please a video game. There is more to it, though. Selfishly, the girl Laura becomes without her boyfriend is not the girl Gordon loves; either way, he cannot have Laura. Also, the second Gordon starts treating the relationship as a simulation, that’s what it becomes. It’s no longer real, but a game he can rig to his advantage; everything he felt is lost in an instant. Aside from that, there is what it would do to Gordon’s soul. After his impassioned speech about how real Laura is to him, if he begins changing her life for his own gain, what’s to stop him from doing something similar if he ever meets an actual girl? If he weren’t so invested in the simulation, it would be easy to differentiate, as Ed and John explain to him, but if Gordon sees no difference, then he could act this way in reality too. One way or another, Laura will change him; thankfully, Gordon chooses to be changed for the better. “Lasting Impressions” is a lower-key episode. There aren’t really any special effects (outside the normal made-up alien characters and shots of space), and the continuity consists of a mention of Ed’s tryst with Teleya and Gordon implying he still doesn’t trust Isaac. Gordon’s loneliness was set up in his own pursuit of who he thought was Lt. Tyler and his mismanaged attempt at promotion, so this is something of a running theme for him. (Not to resurrect a dead horse just so I can beat it some more, but this would’ve been a great complimentary arc to Alara’s inability to find a fella). The subplot where Bortus and Klyden become addicted to cigarettes is absolutely hilarious, and every single gag lands perfectly. The anti-smoking message is a bit tedious at this point (it’s 2019; people know smoking is bad for you), and a crack about global warming is heavy-handed as well (if the future is as bright as The Orville says it is, I guess it wasn’t that much of a problem), but there’s enough humor to make up for the chidings. As he did in “Blood of Patriots,” Scott Grimes brings a touching humanity to Gordon, and even when he has the Simulator get rid of the ex, he remains sympathetic. Leighton Meester is fine as Laura, but I think that’s kind of the point; to Gordon, she’s the most amazing girl in the world, but to everyone else, she’s just one fish in a vast sea, and a fish that’s been dead for 400 years. We see her through everyone else’s eyes, much like we surely have with girls our friends have dated, and that’s important; only Gordon puts her on a pedestal, and that makes his infatuation with her even sweeter. “Lasting Impressions” isn’t one The Orville’s better episodes, but it’s a good insight into Gordon’s pain and yearning to be loved. The humor is sharp, and the different implications of Gordon’s dilemma are fascinating to contemplate, but the season is at a point where a diversion like this, even if it’s good, makes us wish we were dealing with the Krill peace process. The Orville - "Lasting Impressions"